Buy Mephisto Genetics Chemdogging Auto Feminised Seeds from dope-seeds.com today for the best cannabis seed prices online. Mephisto Genetics produce some of the finest autoflowering cannabis strains in the world using their expert knowledge of autoflowering genetics to produce incredible plants. On the burner for several years now welcome to Mephisto Genetics interpretation of Chemdawg turned automatic! Chemdogging was one of the first conceptions to creating new lines of elite auto flowering strains. A cross of a larger sativa dominant auto and chemdawg d IBL now inbred to F4 ( look out for a future Mephisto bx line ‘creme de la chem’). Used to make their hybrid auto ‘chem city Blues’ she has been worked on for several years now, it took several attempts to find the perfect male and female phenotypes to bring the resulting strain to market, with involved testing and selection at every stage. She is a medium to large sized variety, not too stretchy, with medium sized internodes. Chemdogging has juicy, hard very squeezable buds, that smell highly pungent. The interpretation of the smell can range from a minty to intensely rank nose hair burning one. Odour control is certainly recommended. Branches like to grow out and up forming nice sized secondary colas and an Xmas tree structure. 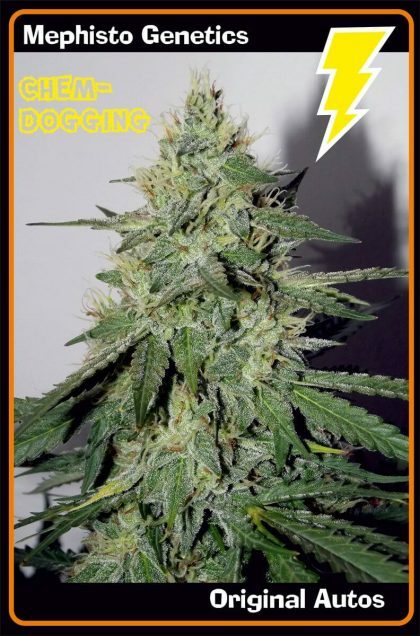 Her potency is on another level, hard hitting and long lasting, with a heavy influence of the elite qualities chemdawg in photoperiod format is known for across the globe. Expect yield upwards of 90g/3oz when provided good conditions.